When I was young I remember that I often used to adjust with the right hand the sidewall dynamo connection-wire sometimes accidentally coming loose while cycling. leakage current was indeed crossing my body. of about 1500 Ohm or even less, that one significantly depending on actual body mass, skin conditions, contact area, applied voltage, frequency, etc. you may have something like 50V that applied to your body might induce in turn something like 30 mA. Something definitely unlikely to happen, I agree, but still possible … especially for grounded hub dynamos and spoilt head lamps with exposed/not well protected live parts. such as muscular contraction (tetanization), difficult respiration and cardiac disturbances. As you can see 30 mA for one sec may already have some annoying effect. Zone 4:is characterized by permanent effects, such as fibrillation, depending, beyond current and time, also on specific health conditions. Contact times as low as 10 ms may be lethal but fortunately these current values seem to be much higher than those ones actually supplied by a dynamo at 50 km/h !! I'm not sure, if your assumptions apply. A bike dynamo is a constant current source, with a current of about 500mA. You are right, unloaded the voltage can be extremely high, I remember something like ~1V per km/h? But the voltage drops significantly with the presence of a load. To the best of my knowledge it is almost impossible to get more than 10W from a bike dynamo. Are these circumstances suficient to get a significant hazzard for the human body? (1) The danger to harm your fingers or even to do a front spin with the bike seems to be much more likely than electrical issues, when you perform ajustments like you descriped. (2) When you cycle faster than -let's say 20 km/h- it is a realy good idea to keep both hands at the bars. People doing dynamo adjustments at 50km/h apply for the Darwin Award. Not because of electrical issues, but because of general safety rules. And, last but not least, I highly recommend the use of a dynamo hub, which avoids a lot of the drawbacks of the old-fashioned bike dynamos. Hi derSammy, thanks for your reply. Yes I agree with you, at 50 km/h is definitely much better to keep both the hands on the handlebar !! A bike dynamo is a constant current source till the load is a prevalent resistive load and its value is negligible compared to the internal reactance of the dynamo; 500-600 mA is the maximum output you can get from a dynamo, even at 100 km/h on a dead short-circuit load !! Yes I confirm: no-load voltage is something like ~1V per km/h. A 6V-3W hub dynamo is capable of delivering 6W at 20 km/h, 10 W at 50 km/h. Output voltage of a dynamo of course is likely to drop with load but the typical 1500 Ohm of a human body will not affect substantially this value at all. ... sometimes just a few mA can kill and that's why worldwide households electrical protection, at least against "indirect contacts", has been generally specified to be put in place through the installation of a good grounding system in combination with a 30 mA RCD-Residual Current Device. The IEC plot below shows that 100 mA for 1 sec might be lethal. I don't know where the diagram is from and I need to admit, that I did not think about the deadly hazzard limits of electricity yet. But I nowhere found an indication, wheather the values hold for DC or also AC (and what is more dangereous)? However, 1s seems to be quite long in my perspective. 54km/h is 20m/s or about 10 roations of the wheel per second. In other words the current will have changed direction about 130 times in 1s. 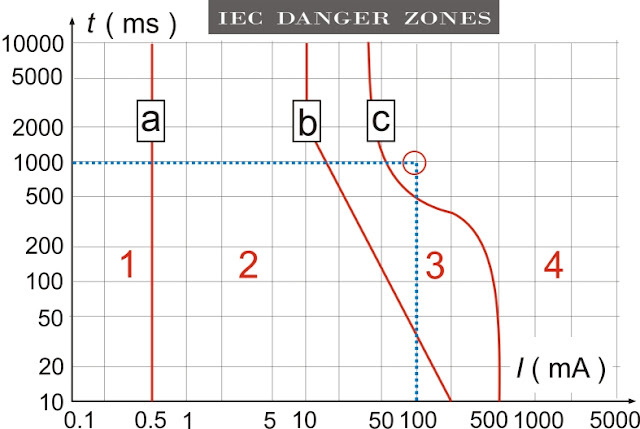 The above diagrams are based on IEC electrical safety related standards and in my case more specifically on publications of Prof. V.Carrescia teaching “Electrical Safety” at the Polytechnic of Turin, Italy. Considering the very low currents involved I don't think there are big differences between DC and AC, except for body resistances/impedances varying according to specific frequency. Your calculation is correct, 54/3,6=15, not 20 as I claimed. And I probably mixed up the number of magnets and the number of poles.